For which applications of the cosmetic industry the ROTOCAV hydrodynamic cavitator can be successfully applied? 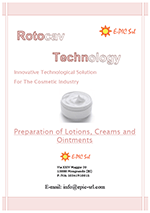 ROTOCAV hydrodynamic cavitation technology can be successfully applied for the optimization of the main process steps of Cosmetic Industry (mixing, homogenization, solubilization, functionalization, hydration of thickeners and stabilizers, production of stable emulsions) for the preparation of lotions, creams and ointments. Which are the advantages of a ROTOCAV cavitator in an industrial cosmetic plant? The result of the rapid and cheap treatment is a high quality final product.